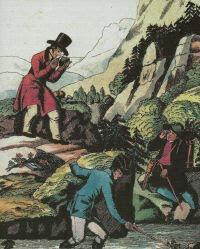 The 21. August 1986 was market day in the village of Lower Nyos (Cameroon), from the surrounding mountains many herdsmen brought their livestock to do business with the local farmers. In the evening, at 21.30 p.m. most of the peasants and their guests were sleeping and didn’t notice the sound of an explosion coming from Lake Nyos, two kilometres distant to the village. The few survivors report that their family members were eating, in the very next moment suddenly tumbled on the floor, death. A woman awaking the next morning found their five children dead in their hut. In Nyos that evening 1.700 people died. Rescue troops that arrived in the valley some days later reported of a sinisterly scene, villages with huts and gardens untouched, but everywhere bodies of humans and animals, there weren’t even insects on the corpses.The unseen killer was a 50m high cloud composed of 1,6 million tons of carbon dioxide, erupted from Lake Nyos and denser then the surrounding air following the valley for 27 kilometres, killing more then 1.700 people and 3.000 animals. Fig.1. 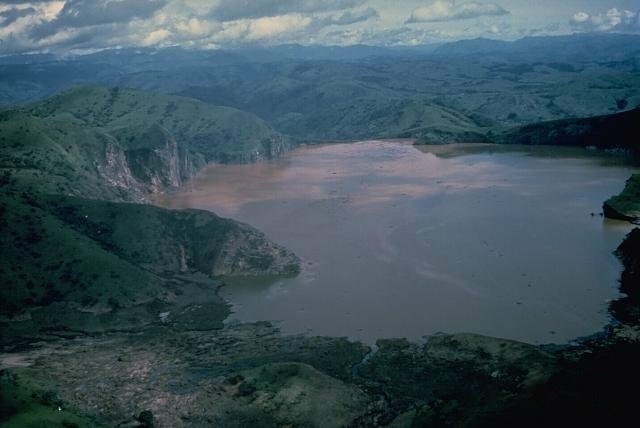 Lake Nyos as seen some days after the catastrophic release of carbon dioxide. It is thought that the violent degassing mobilized the lake sediments from the bottom and huge waves eroded part of the steep shores, bringing sediments in suspension and colouring the lake brown. On the border are various landslide scarps visible, it is possible that a landslide triggered the degassing of the lake (photo credit LOCKWOOD 1986). Fig.2. Carcasses of animals as found some days later after the catastrophe, the bodies showed no injuries, the animals were asphyxiated by the carbon dioxide erupted from the lake (photo credit LOCKWOOD 1986). This deadly phenomenon is explained by the geological position of Lake Nyos, situated in a volcanic caldera. Calderas possess steep walls and cliffs delimiting it, so that if the Caldera becomes filled with water, the resulting lake is relatively deep. Because of their depth, these lakes show a strong temperature gradient between superficial and bottom water layers, resulting in different water densities. In temperate zones during summer the warmer and lighter water remains at the surface, preventing deep reaching currents and a mixing of the different layers. During spring and autumn the surface water cools, and sinks to the bottom. However in the tropics the constant warm climate during the entire year prevents this cooling, so that the bottom water becomes impoverished in oxygen and enriched in gasses emanating from the volcanic ground, mainly carbon dioxide, or created from the decomposition of organic material, mainly methane, for many years. This poisoned zone is called Monimolimnion. In a depth of 200m the water can so accumulate ten times more carbon dioxide then on the surface. It’s not definitively known what finally triggered the lethal eruption of Nyos, it was speculated that an earthquake or submerged volcanic eruption disturbed the water stratification in the lake, enabling the accumulated carbon dioxide to escape its wet prison. The days before August 21 were rainy; it is also possible that the rainfall cooled the superficial water layers so much, that an intermixing with the denser and poisonous water occurred. A fourth possibility, supported by the observations of various landslide scarps on the shores of the lakes, is that a landslide triggered by the rainfall felt in the lake, disrupting the layering of the water column, and so eliminating the “cap” that prevented the carbon dioxide bubbling out from the gas rich bottom water. The particular settings necessary for poisonous lakes, resulting from their geographic, climatic and geological circumstances, is known for only three lakes. Lake Nyos and Lake Manoun located in Cameroon, and Lake Kivu located at the border of Ruanda and Congo. On August 15 1984 an explosion, probably caused by the release of gases, at Lake Manoun killed 37 people. At Kivu, with his densely populated shores, the concentration of lethal gases, in part of volcanic, in part of bacterial origin, in a depth of 500m is extraordinarily. If an event like at Nyos happened, the live of hundred of thousands of people would be threatened. To prevent a natural and presumably catastrophic degassing of the lakes, in the last years the lakes are intensively monitored and the bottom water is brought to the surface under controlled conditions by tubes, where it can degas. 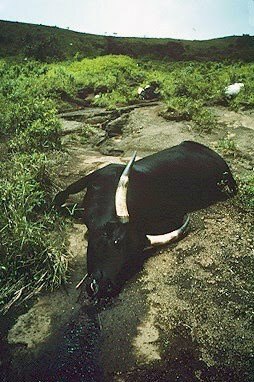 Were no evidence earthquakes, landslides and cold rains during the catastrophe in 1986 at Lake Nyos. Is proved that of Catastrophe 1986 at Lake Nyos and at 1984 at Lake Monoun were triggered by the gas explosions in solid sediment's stratums under the lake’s bottom. Hydrogeology of aquifer in solid sediment's stratums under the lake’s bottom and leakage vulcanic gases into the aquifer - clue for resolving problem connection catastrophes 1986 at Lake Nyos and at 1984 at Lake Monoun.